Millward Brown have just announced Google as the world's most powerful brand. This may be true and is yet further evidence of the shift towrads a internet centric life. But working off the premise that "a brand exists entirely in people's heads. Therefore, whatever it is they say a brand is, is what it is", how do you think Google would hold up? 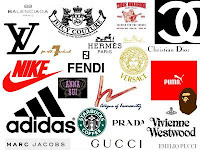 Brand Tags is a site that allows you to tag brands with whatever words you associate with the brand and then converts the brand into a weighted tag cloud of associations. The bubble may not have burst for Google, but if the internet is to become the great media democracy then sites like Brand Tags may well threaten the empire!